however, these did not exist at the time of the painting's creation, but appeared later because of erosion. Friedrich often composed his landscapes from carefully chosen elements of different sketches, so that a specific location is not necessarily discernible. Two trees, whose leaves cover the upper third of the painting, frame the scenery. Two men and a woman in town clothes gaze in wonder at the view. The thin figure in the middle is usually interpreted as Caspar David Friedrich himself. 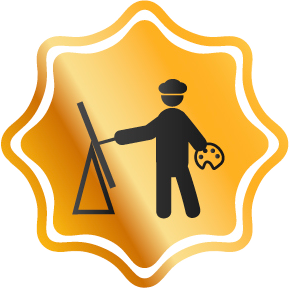 His hat lies beside him as a sign of humility. He seeks for a foothold in the grass as a symbol of the transience of life and looks into the abyss opening before him—the abyss of death. On the right, the man with crossed arms leans against the trunk of a dying tree and looks far out to the sea. 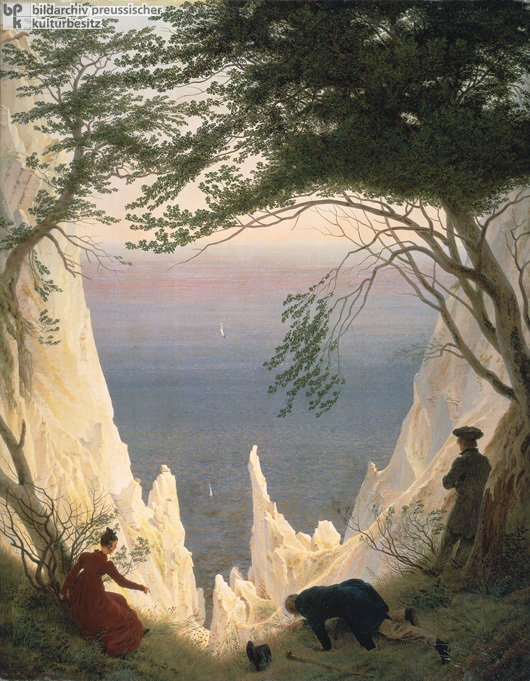 The two tiny sailboats stand as symbols for the soul which opens to eternal life and correspond to the figures of the two men On the left, the woman in a red dress (who is usually identified as Friedrich's wife Caroline) sits beside an almost dried-up shrub: only the twigs around her face are leafing out. With her right hand she points either at the abyss or at the flowers bordering it. In contrast to the men, who gaze either at the abyss or into the distance, she communicates with the other figures—whether she feels threatened by the abyss or compelled by the natural beauty is unclear. 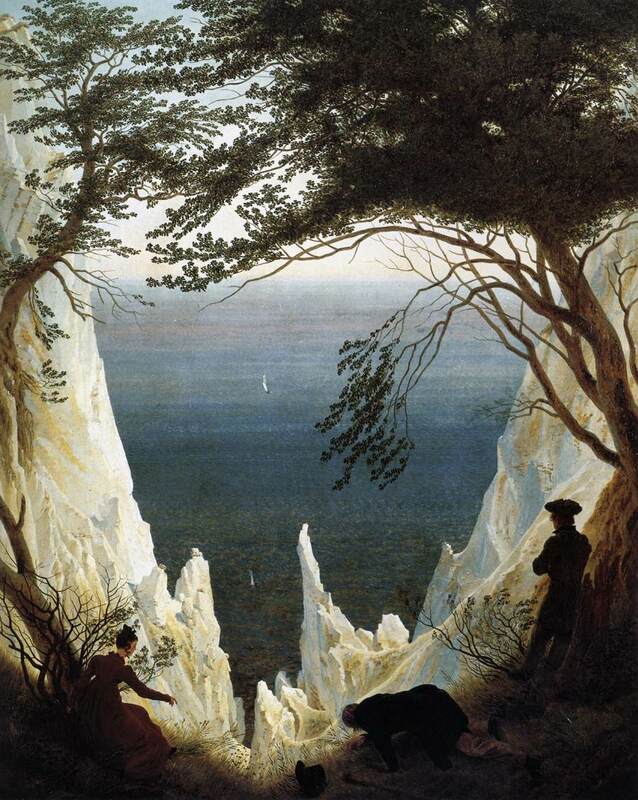 Find and save ideas about Caspar david friedrich on Pinterest. | See more ideas about Casper friedrich, Caspar david friedrich paintings and Casper david.